The Stifterverband repeatedly awarded the logo “Innovative by Research 2018/2019” of the Stifterverband für die deutsche Wissenschaft e.V. (German Association for the Promotion of Science and Education) to HYDRIVE Engineering. Thus, the company’s commitment in the fields of university research, teaching and association work has already been recognized for the third time in a row. Thanks to the close cooperation with its customers, HYDRIVE Engineering is always up to the minute. At the same time, the company is pursuing the latest findings from research and development. HYDRIVE Engineering has recognized that machines must be functional and easy to operate, dynamic and accurate, robust and efficient. The result is that tomorrow’s machinery and equipment are the focus of everyday work. In this way, customers always receive the best solutions for their challenges. This results in innovative drives and controls, tailored to the customer’s requirements. Even novel control algorithms are the result of this high standard. The excellent education of all employees of HYDRIVE Engineering is an important prerequisite for fulfilling this high standard and promoting innovation. Besides, employees are supported in their work when they become aware of and follow the latest developments in applied research. That’s why HYDRIVE Engineering is very interested to get involved in education. Especially university research and university teaching are in the focus here. So, our managing director Thomas Neubert and Mr. Erik Lautner from HYDAC International GmbH have developed a lecture at the TU Dresden. The lecture “Controls, Software Development and Safety in Mobile Machinery” is offered since the winter semester 2014/2015. During the summer semester, the lecture will be given by one of our long-time employees, Dr. Ing. Dirk Wehner. In addition, the company is actively involved in various associations. One example is the Research Fund for Fluid Power in the VDMA (German Engineering Federation). 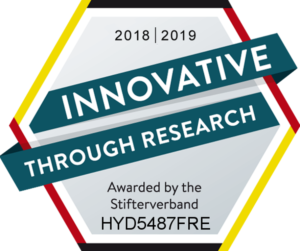 This commitment has now been awarded the logo of quality “Innovative through Research” for the third time in a row by the Stifterverband für die deutsche Wissenschaft e.V. The Stifterverband was founded in 1920. Approximately 3,000 members of companies of all sizes have joined forces in the Stifterverband. In addition, business associations and founders are among the members. But committed individuals also actively participate in the association. The organisation stands for the joint responsibility of German companies, so that our society remains sustainable and worth living. This makes the Stifterverband a unique network of business, science, politics and civil society. Primarily, the Stifterverband sees its purposes in the areas of education, science and innovation. The organisation, but also HYDRIVE Engineering, believe that all three topics are inseparable: “No innovation without science and no science without education”. https://hydrive-engineering.de/en/wp-content/uploads/sites/3/2018/05/Forschung_und_Entwicklung_2018_print_en_larger.png 743 887 Diana Schilder https://hydrive-engineering.de/en/wp-content/uploads/sites/3/2016/03/hydrive_logo_web.png Diana Schilder2018-06-21 10:46:322018-06-21 11:50:46HYDRIVE Engineering awarded again as "Innovative through Research"